Remember a few post ago, I had mentioned a failed skirt project due to improperly thick coating material I picked? After moping about it a few days, I decided to finish it up and just see how it goes. Surprisingly, it is pretty cute on me and goes well with a few grey sweaters I got. It is made with Burda magazine 2009/08 skirt 107, which was very easy. I think it might be a little larger than it should be around the hip area, but my material is so thick, I dont know if that might have caused any skewing. I am starting to get a good hang of the check matching business — even the pocket is matched! I also lined it with a happy yellow satin. It shows a little on the top — but I dont mind. I couldnt bring myself to use another strip of thick material to line the waist band. The material was bought from fabric.com a year or two ago. I thought I wanted it for a coat, but I am always afraid that it might look too busy. I think it works great as a skirt material — maybe one with less seams would be better, like a mini skirt! I got those cute dome buttons from ebay, love them! This entry was posted on Monday, January 24th, 2011 at 12:36 am	and posted in finished pieces. You can follow any responses to this entry through the RSS 2.0 feed. Well done on hitting 1:1:1. Teh skirt is ver chic – love it. Oh gee – I rushed that and just look at my spelling! What I was trying to say was that the skirt was very chic and I love it! Cute skirt. Glad, you did not gave up. And you shoes are adorable! thanks! those are seriously the most awesome shoes i got, it goes with everything! I really like the skirt, I can’t believe you got it to work with such a thick fabric, but I’m glad it worked out. 🙂 What kind of lining did you use? 🙂 me too! the lining is a polyester satin, its not the thinnest material but with a thick coating material, i am hesitant to use a very filmsy one! Great job with matching the plaid! 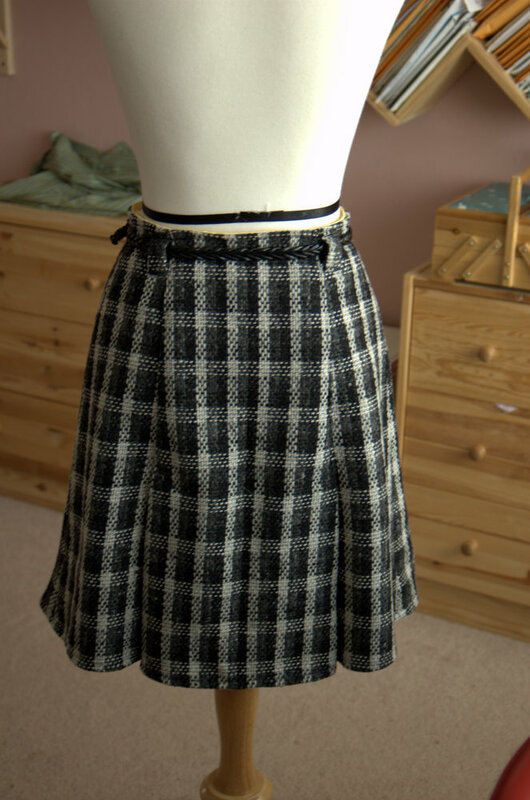 Wow the skirt is pretty cute and looks perfect with grey and black. they are a little narrow in the toe box, but i think it managed to be a little stretched out after wearing it so much! I really like this! And the yellow lining is great. I think it makes a garment extra special when there’s a contrasting lining. Love the skirt!! The yellow satin lining is a nice touch you added! The whole look altogether is very chic!